Daily newspapers have been writing their own obituaries for so long now that most readers have become desensitized to the stumbles, falls and collapses of some of the nation’s venerable gray ladies. Our local dailies seem to be holding their own after their own rounds of layoffs and reorganizations as the new “normal” of newspapering emerges. But what about the smaller alternative publications that dot the city’s landscape? How are they faring? 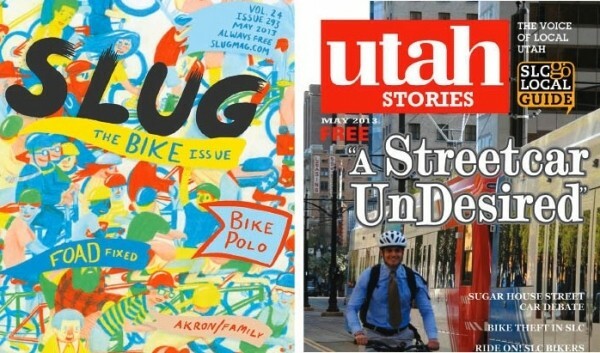 A good many Salt Lake City “alt-y” publications have managed to outlast the economic turbulence of the past few years. This week, we look at how two local monthly magazines have diversified their efforts to stay in the game. Since 1989, SLUG magazine has proven that you can create a renowned local print magazine without paying the majority of your writers. With 150 volunteers, SLUG has a name recognition that allows it to attract the talents of budding writers longing to contribute to a publication with roots that go deep underground the mainstream community. While SLUG struggles the same way other publications do to explain to advertisers that a publication is bringing them business, SLUG publisher Angela Brown says the community brand of SLUG provides its own incentive. Such cache is not attained solely through acerbic wit and writing—a lot of the paper’s clout comes in part from Brown’s tireless efforts promoting and hosting community events. Brown is the paper’s third publisher and has been at the helm for 13 years, during which she’s taken her previous experience of hosting listening parties for record labels to make SLUG a name in the community. She’s helped host skateboarding, snow and ski competitions, the popular Localized music series and, in 2009, helped to create Craft Lake City, an annual gathering and celebration of the art of do-it-yourself crafters whose wares aren’t necessarily a good fit for gallery walls. Since SLUG rolled out its bazaar of craftiness, the event has become popular enough that Brown says she’s spinning it out into its own nonprofit entity so that it can be self-sustaining without draining the small SLUG staff that is already kept busy with the print publication. But, if nothing else, it’s another community event shoring up the anti-establishment credibility of SLUG. Like other media, Brown has been quick to diversify content: issuing a SLUG newsletter, airing a regular podcast titled Soundwaves From the Underground and pushing more exclusive content to SLUGMag.com. Right now, she says, SLUG isn’t shrinking or growing, but is holding its own. In a small downtown Italian restaurant, Richard Markosian, founder of Utah Stories, gathers for a spaghetti lunch with a couple of employees. With a large TV newsman’s video camera on the table, he stops between bites to record an interview of an elderly woman who’s irate about the parking meter outside the family-run eatery. To some mainstream reporters, covering upset diners might seem like a crap assignment, but for Markosian, reporting on the trials and tribulations of small businesses is his bread & butter. “More and more often in our society, corporate America is moving in and the locals are moving out—and the government is facilitating that process,” he says. To that end, Markosian’s free glossy publication has seemingly dedicated itself to advocacy journalism for small businesses. The most recent issue of Markosian’s booklet-size monthly publication tore into the Sugar House streetcar in the cover story, titled “A Streetcar Undesired.” Markosian reported on a public hearing, as did other publications, but he focused his article on the large public opposition, naming more than a dozen businesses that will be affected by the then-proposed extension of the streetcar line along 1100 East (the council has since approved this line despite public outcry). Markosian punctuated the reporting with his own editorializing: “The cultural, historic and economic value of Sugar House is far too much to gamble on ‘form-based’ city planning,” he wrote. Markosian, who has a background in documentary filmmaking, started Utah Stories in 2006 as a video-news site but, struggling to find a way to monetize the endeavor, subsequently turned it into a small monthly publication in 2007. Focusing on in-depth features about small-business issues and profiles of local businesses provides an advantage with advertisers, though Markosian says Utah Stories’ rates are also pretty dang cheap. That being said, he says his publication doesn’t write stories in exchange for ads. Markosian says that, on the contrary, the publication checks out potential advertisers before accepting ads, having turned down restaurants’ ad money in the past because Markosian didn’t think the food was that good. Markosian says the focus on hyper-local journalism is paying off, and that in July, the publication will begin upping the number of issues it distributes and expanding in future editions to bring back video content to the publication’s website.